We're putting together our roster for 2014/2015. Fuse Multisport athletes have had a track record of success over the last three seasons. Our squad has included multiple AG World Champions, we have achieved Open AG podium results across Australia in sprint and standard (Olympic) distance events, we have won State Championships, and taken out top 10 results at World AG Champs over the standard distance. As a squad, over the last three seasons we think we have competed in more international and national level sprint and standard (Olympic) distance events than any other SA squad or club, with races in London, Auckland, Geelong, Mooloolaba, Devonport and Sydney - and we have a breadth of experience from that. We'd like to see greater opportunities for South Australian juniors and U23 athletes to experience top level triathlon - and we'd like to see more juniors and U23 athletes excel in triathlon in SA. To do that, we need to identify and inspire the next generation of high performance athletes. We are ready to expand our program to provide a pathway for junior athletes. We're also ready to pass on our experience to AG athletes looking for a structured training environment. We're searching for the next generation of high performing triathletes. If you're a junior talented junior swimmer, cyclist and/or runner who wants to have a go at triathlon - get on board the Fuse Development Squad for season 2014/2015. Sponsorship support is available for talented athletes. If you're an AG athlete looking for a structured training environment - become a part of Fuse AG. We think our structure is unique to SA - we just need to find the athletes to make it work! Are they out there? If they are - we'll throw everything we've got at getting this working. Next season promises to be huge with the World Duathlon Championships to be held here in Adelaide. We know how to race fast - and we know how to have fun doing that. 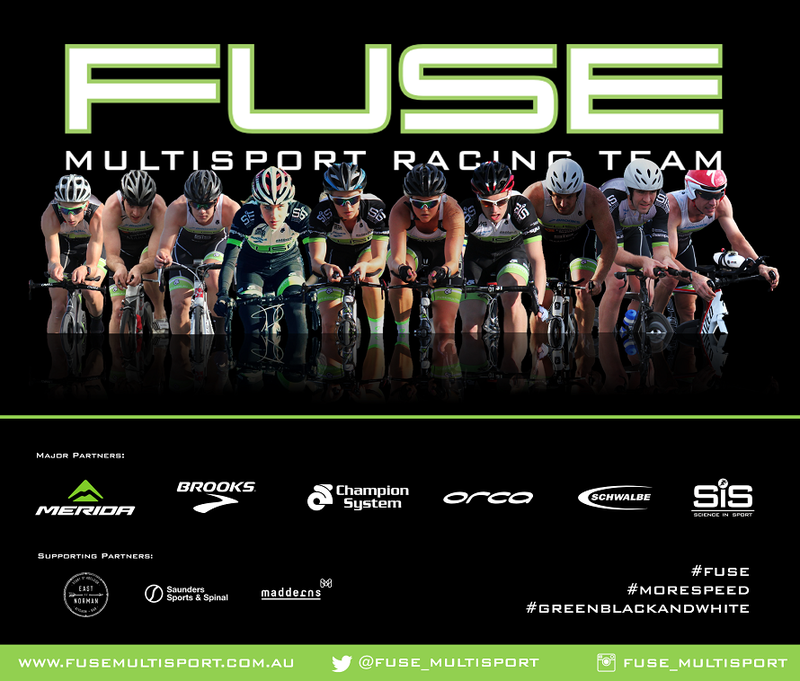 Contact steve@fusemultisport.com.au to find out more.